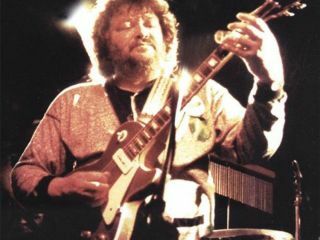 Rock guitarist Delaney Bramlett, who collaborated with George Harrison and Eric Clapton, has died in LA following gallbladder surgery. He was 69. His wife, Susan Lanier-Bramlett, said he died on 27 December after "seven hard months" of ill health. Bramlett came to prominence in the late 1960s as part of combo Delaney And Bonnie, which he formed with his first wife, Bonnie Lynn. The group toured as support to Eric Clapton's post-Cream band Blind Faith, and Clapton became a regular sideman to the duo. Indeed their 'and Friends' backing bands became well-known for the more-famous sidemen, including not only Clapton, but also George Harrison, John Lennon, Duane Allman and Gram Parsons. Bramlett, in turn, produced Clapton's self-titled debut solo album in 1970, and co-wrote most of the songs, including the gospel-influenced hit single, Let It Rain. The duo broke up personally and professionally in 1973. Their daughter is Nashville singer Bekka Bramlett. Here's Delaney And Bonnie with Clapton on guitar in 1969.